On Tuesday, April 9, the U.S. Department of Agriculture (USDA), the U.S. Environmental Protection Agency (EPA), and the U.S. Food and Drug Administration (FDA) released an exciting new interagency strategy to reduce food waste. As FLPC wrote in an earlier blog post, this strategy is the first time these agencies – or any federal agencies – have created a coordinated plan to attempt to reduce the 40% of food that goes to waste in the U.S. The strategy identifies six priorities on which the three agencies will coordinate. This post outlines several actions that the federal agencies can take within these priority areas to maximize food waste reduction. The strategy’s first priority area calls for improved coordination between EPA, FDA, and USDA in order to maximize resources and avoid redundant efforts. FLPC has long advocated for improved interagency coordination on the issue of food waste. Food waste is often left out of the calculation when policies are developed simply because it is not on the radar of decision makers. Better coordination among agencies can ensure that measures to address food waste are included in relevant federal programs, such as conservation programs and food assistance programs. FLPC has also been an advocate for enhanced coordination across the food system more broadly. In February 2017, FLPC and the Center for Agriculture and Food Systems at Vermont Law School published a report proposing a national food strategy that would require a coordinated approach to policymaking and regulation of the food system. We are pleased to see the federal agencies recognize the need for improved coordination and hope that their efforts around food waste can serve as a template for other areas of the food system. Recognizing that many consumers do not know about the issue of food waste, the second priority area proposes the development of a consumer education campaign by the federal agencies in partnership with public and private sector entities. According to ReFED, consumer education campaigns are one of the top two most cost-effective food waste solutions and have the greatest overall diversion potential at 584,000 tons. In the United Kingdom, a similar national education campaign led to a 21% reduction in consumer food waste over five years and had a 250 to 1 benefit-cost ratio. Several national consumer education campaigns, such as the Save the Food campaign created by NRDC and the Ad Council, already exist in the U.S., as do various local, state, and regional campaigns. Federal government support can build on existing campaigns like Save the Food and utilize their research and materials to help ensure that the information is disseminated more widely and better incorporated into other relevant federal programs and materials. Priority Area 3 proposes enhanced coordination and guidance on food waste measurement in order to help refine food waste reduction goals and better report on progress. Data on food waste trends can help government entities, businesses, and other stakeholders identify the most effective solutions and track progress over time. States and localities have been at the forefront of efforts to measure food loss and waste. For example, the Oregon Department of Environmental Quality, in partnership with Portland State University’s Community Environmental Services, is conducting a five-part Wasted Food Measurement Study that will look at the amount of food waste generated in the state and seek to identify drivers of food waste. In addition to coordinating among federal agencies and developing voluntary guidance on best practices, the federal government can advance food waste measurement efforts by providing funding to support state studies and initiatives to measure food waste. The fourth priority area seeks to reduce confusion by providing guidance on food date labels, food safety, and liability protections for food donation. Federal action to streamline and provide clarity on each of these topics is consistent with longstanding FLPC recommendations. Confusing date labels result in unnecessary food waste among consumers and in the retail sector. Because of a lack of federal law standardizing date labels, date labeling language varies from state to state and across food products, and date labels generally have no relation to a food’s safety. Yet 84 percent of consumers report discarding food close to or past the date on its package. Federally-standardized date labels are the most cost-effective solution to food waste according to ReFED and have the potential to divert an estimated 398 thousand tons of food waste. Important steps have been taken in recent years to reduce consumer confusion by encouraging the use of standard date labeling terms to indicate quality and safety. In particular, FLPC applauds USDA’s industry guidance, which encourages manufacturers to use the standard term “Best if Used by” to indicate product quality. We have also been excited to see industry action to standardize date labels, most notably the voluntary Product Code Dating Initiative. Launched in 2017 by the Food Marketing Institute (FMI) and the Grocery Manufacturers Association (GMA), this initiative encourages businesses to use only one of two standard phrases on any food product: “BEST if used by” for products where it is an indicator of quality, and “USE by” on products that may have a safety risk over time. However, due to conflicting state laws and the voluntary nature of this initiative, universal adoption of these voluntary standards cannot happen without federal action. Therefore, the federal agencies should work with Congress to support federal legislation to standardize date labels; alternatively, FDA and USDA can require the use of standard date labeling language on products within their jurisdiction through regulations. Once labels are standardized, the three agencies can work to educate consumers to make better decisions and waste less. The Bill Emerson Good Samaritan Food Donation Act provides strong liability protection to food donors and nonprofit organizations that distribute donated food. Yet many food retailers, restaurants, and manufacturers still cite liability as a barrier to food donation. The federal agencies can promote food donation by raising awareness of the liability protections available under the Emerson Act. Additionally, USDA can provide clarity on ambiguous terms in the Act by developing guidance on the scope of the available protections. These actions are consistent with provisions in the 2018 Farm Bill instructing USDA to create guidance on elements of the Emerson Act and to raise awareness of the liability protections provided by the Act. With the focus on this topic as part of the interagency food waste strategy, FLPC hopes to see agency action to clarify and raise awareness about this important protection so that donors are encouraged to donate safe, surplus food. We also hope that the agencies will support efforts to enhance Emerson Act protections to better align with the modern food recovery landscape, such as the Food Donation Act of 2017 or similar efforts. Another key barrier to food donation is confusion about what safety procedures are required for food donation. A fifty-state survey of state food safety officials, conducted by FLPC and the Food Safety for Donations Working Group, found that one reason for this confusion is that most states and localities do not have regulations or guidance on this topic. Most states and localities use the FDA Food Code, a model code developed by the Conference of Food Protection, as the basis for their food safety regulations for restaurants and retailers. Because the FDA Food Code does not include information about food donations, very few state or local regulations address this topic. The agencies, particularly FDA, can support safe food donation by creating guidance for restaurants and retailers on food safety practices for food donation; this guidance could be part of the FDA Food Code or separate. FDA can also create similar guidance for food facilities. The fifth priority area calls for collaboration between the federal government and the private sector. Food businesses have been leaders in food waste reduction efforts, with many adopting food waste reduction goals and implementing practices to reduce food waste in their operations. 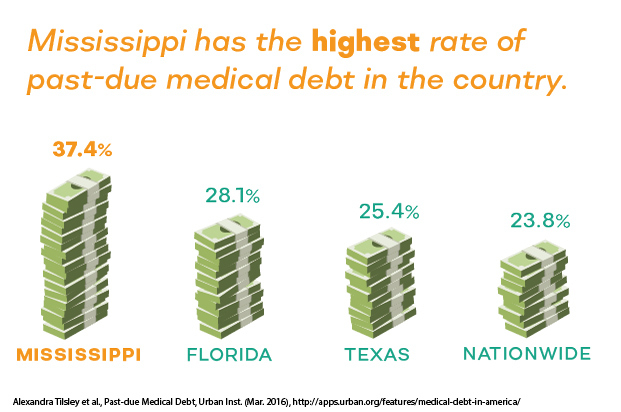 Yet limited data exists on the scope of these goals and the impact they have made. The federal agencies can help advance private sector initiatives by working with food businesses to collect, analyze, and report information about their efforts and their progress towards their goals. The final priority area seeks to position federal agencies as leaders by example, by encouraging federal agencies to reduce food waste in their own cafeterias and events. The Federal Food Donation Act of 2008 represented an important first step in this direction; the Act encourages executive agencies entering into food service contracts above $25,000 to donate excess food. Agencies must include clauses in their contracts encouraging the contractor to donate surplus food to the extent possible. However, the Act does not actually require the agencies or their contractors to donate, or even to report on the amount of food that is donated. FLPC has made recommendations to strengthen this Act by requiring federal agencies to report on the amount of food they donate and requiring contracts to include language mandating that contractors take steps to donate surplus food. EPA, FDA, and USDA can model the federal government’s commitment to food waste reduction by including provisions in their own food service contracts that require the contractors to enter into agreements with food recovery organizations to donate excess food. The agencies can also commit to taking steps to reduce the amount of food waste generated in their cafeterias, and to sending excess food that is not edible to organics recycling facilities to the extent possible. Finally, the agencies can commit to collecting and publicizing data on the amount of food that they donate and recycle. FLPC is thrilled to see the agencies begin to take coordinated action on food waste, and we hope to work with the agencies and other stakeholders to implement some of these next steps. Originally published April 18, 2019 by The Guardian. Written by Dale Berning Sawa. Nash had always been averse to wasting food, but now he started documenting his experiences. He whipped up cream to use, uncooked, almost four months past the date on the carton, and stirred artichoke lemon pesto through pasta seven and a half months in. There was also minced beef (15 days old), smoked trout (24 days past sell-by), smoked turkey (six weeks past use-by), chicken broth (more than three months past best-before), roasted tomatoes (seven months past sell-by) and tortillas (practically a year old). Still nothing happened. It raises the question: were the dates just wrong? Have more compliant people the world over been binning perfectly good food this whole time? Should we be eating expired goods? Clearly, this lack of clarity has implications for both the health of the environment and the health of the nation. What you don’t eat, you’ll end up binning, even if you could have safely eaten it; and what you don’t know not to eat could make you sick. A joint report from the Natural Resources Defense Council and Harvard Law School in 2013 said that 40% of American food goes uneaten each year, and the disorienting effect of the US date labelling system is in large part to blame. At the same time, said the report, that system fails to convey important food safety information, “despite the appearance of doing so”. Yet date labeling has been accused of generating both confusion and food waste in the UK, too, or of simply being ignored. As recent research by the makers of the food-waste app Too Good To Go shows, British home cooks threw away a whopping 720m eggs in 2018, with one in three saying they will bin any carton that is out of date. Yet eggs in the UK carry a best-before date, not a use-by. In April 2019, Harvard University officially implemented Harvard’s Sustainable Healthful Food Standards. The Standards were led by the Office for Sustainability, with input from a multi-disciplinary faculty committee (including FLPC Director Emily Broad Leib), the Council of Student Sustainability Leaders, and experts in the field. Align food providers around a shared vision and common set of evidence-based aspirations and principles. Quantify the environmental and health impacts of the campus food system through reporting. Optimize the campus food system for well-being, climate and community. Drive changes in the marketplace through partnerships and by leveraging purchasing power. Enhance food literacy across the Harvard community, and beyond. FLPC applauds Harvard University for its commitment to improving the health of its students, staff, and the planet, and was happy to lend its expertise to the development of the standards, and to the creation of the standard for food waste reduction. The Standards recommendations for the reduction of wasted food, based on a research project by FLPC staff and students, include implementation of practices to motivate patrons across the Harvard campus to divert wasted food from the landfill and incineration; reduction of food waste at the source; diversion for consumption by humans (e.g., food donation); diversion for agricultural and industrial uses; composting, land application, and digestion; the creation of a system to track wasted food with report at least twice a year; and the creation of an on-going, formal relationship with a local food donation partner. FLPC looks forward to supporting the University in implementation of these standards, both through future student research and work, and through Prof. Broad Leib’s ongoing membership in the Standing Food Standards Committee, which will monitor implementation. Learn more about Harvard’s Sustainable Healthful Food Standards in a recent Harvard Gazette article. Originally published by Pacific Standard on April 2, 2017. Written by Emily Moon. Last week, the agency’s outgoing Commissioner Scott Gottlieb said the FDA was still debating how to define “healthy” and would likely issue a rule this summer, in an interview first reported by Politico. According to Gottlieb, the icon’s look remains unclear. “There’s sort of rigorous debate going on about whether or not we include the FDA logo in the logo,” he said on Thursday, according to the agriculture news service The Hagstrom Report. What do we know about debate over this proposal, aside from the design challenges? Consumer advocacy groups like the Center for Science in the Public Interest have long argued that lack of regulation has enabled “food labeling chaos.” They say companies have been allowed to market their products using words like “natural” or “heart healthy” without providing evidence, thereby misleading and even deceiving the public. As studies on consumer behavior show, this approach often works. “Research suggests that consumers believe front-of-package claims, perceive them to be government-endorsed, and use them to ignore the Nutrition Facts Panel,” wrote prominent nutrition and public-health advocate Marion Nestle in a 2010 opinion piece. Nestle and the article’s co-author, researcher David Ludwig, also brought up another concern: Food companies will always have a vested interest in selling products, which will “undermine the educational purpose of labeling” without greater scrutiny. But as a study published this month notes, consumers do not evaluate these messages in the same way the FDA does, often giving more credence to the least regulated claims. “Research indicates that consumers cannot differentiate among different types of claims or distinguish the level of evidence supporting them, and consumers actually find structure/function claims more convincing than health claims,” New York University public-health lawyer Jennifer Pomeranz wrote in the study, which lists the Center for Science in the Public Interest’s president as co-author. In a bid to make the definition of “healthy” more science-based—and communicate that evidence to consumers—the agency issued a new guidance to food manufacturers in 2016. The FDA has taken little action since extending the comment period to this guidance in 2017, but its efforts will undoubtedly outlast Gottlieb, who has said he will be departing this month. 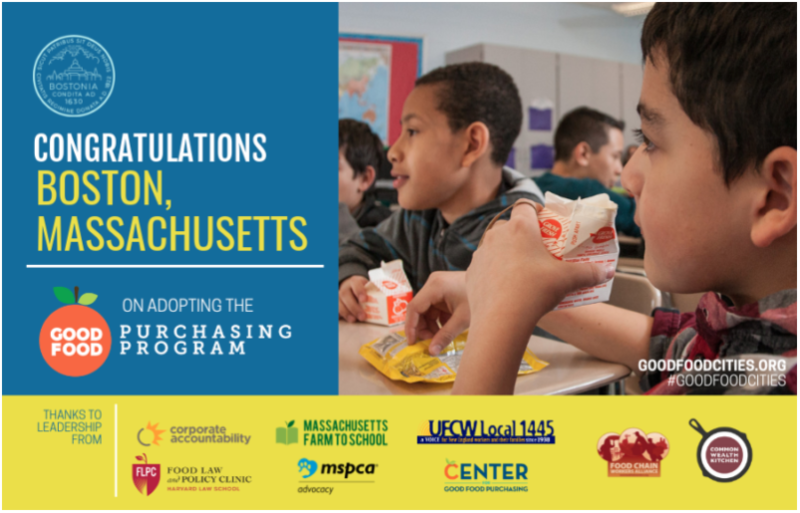 Last month, the Boston City Council unanimously voted to adopt the Good Food Purchasing Program (GFPP). GFPP requires the city to meet certain requirements for nutrition, sustainability, animal welfare, and labor, when making food purchases. This policy applies to purchases made by all city agencies, and will have the greatest impact on the Boston Public Schools, which spends approximately $18 million per year on food. GFPP helps ensure that this money is used to purchase healthy food and to support sustainable and responsible producers. GFPP was developed by the Center for Good Food Purchasing, which helps manage the adoption and implementation of GFPP by cities and institutions. According to the Center, seven GFPP policies have been passed to date at the local or institutional level. Boston’s ordinance goes beyond the other cities, and includes particularly strong language around racial equity. The ordinance seeks to support vendors that invest in disadvantaged communities — for example, vendors that hire disadvantaged community members, are women- or minority-owned, and pay all workers living wages — by awarding these vendors bonus points in the review process for purchasing contracts. Boston’s policy also includes robust provisions to increase transparency in the food purchasing process. FLPC worked with a coalition of local advocates to strengthen the language in order to increase opportunities for the public to have their voices heard during the procurement process. We were thrilled to see the Boston City Council adopt language to establish public hearings on purchasing recommendations and require the public release of certain materials related to purchasing, such as vendor proposals and the agency’s evaluations and recommendations of these proposals. The Boston ordinance also creates a Community Advisory Council that will assist with the implementation process. FLPC looks forward to continuing to work with local stakeholders and with the City of Boston towards implementation of the GFPP, and applauds Boston City Council for this exciting new legislation! For more information about Boston’s adoption of the GFPP, see the press release.